You may have noticed this weekend, and over the past week, the moon was particularly bright. This was because just yesterday on Sunday a supermoon occurred, lighting up the sky. A supermoon is a phenomenon that occurs when the moon is full and near its perigee, which is when the moon orbits closest to Earth. The alignment allows the moon to appear 14% larger and 30% brighter than normal. This is rare due to the moon’s elliptical orbit, which is not in sync with its perigee often. However, what is more common to see are the phases of the moon, which goes through a cycle of waxing and waning from crescents to full moons. If you missed the supermoon, here is another representation of the moon through science. 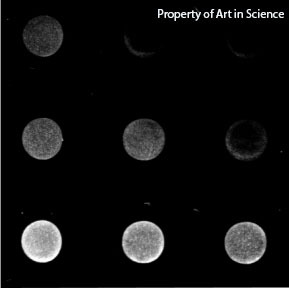 The featured artwork from Hetty Nie (Biomedical Engineering 2016) is aptly called Phases of the Moon. The image was produced from through confocal microscopy by scanning a laser across a think film of gold which removes a non-adhesive layer from the gold surface. This then allows fluorescent protein to adsorb onto the areas that were scanned. From the right top corner there is a very faint dusting of gold that is left, which looks like the beginning of a new moon. As you travel to the bottom left corner, there is more residue of gold left behind, which incrementally look like the moon waxing into a crescent, until it reaches a full moon at the end.